Our 2nd Artist Trading Card exchange happened just before Christmas, and in the interest of supporting local businesses (and our stomachs) we decided to meet at a delicious tamale joint near MacArthur Park in Los Angeles, called Mama’s Hot Tamales. I hear they recently changed ownership, but still have great food. This time, we decided to make ATCs at our meeting instead of coming with them prepared. With the Christmas season upon us, I decided to make some anyway… and to make them edible! I had an idea to try and make ATC Christmas cookies using my pyrography pen to burn designs into the dough, but I tried and failed. 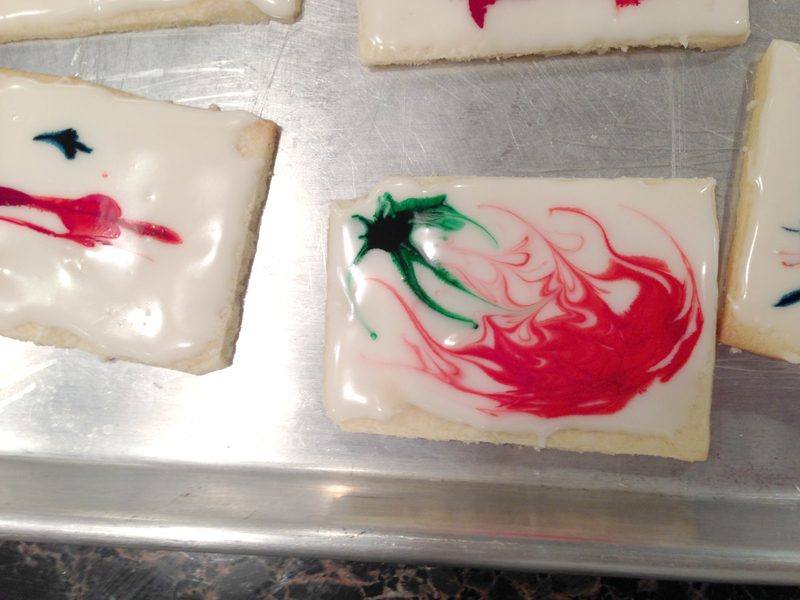 Plan B: do something on top of the cookie with food coloring and frosting. I quickly found a bunch of recipes and ideas online and adapted them to my purposes. I used this recipe from Alton Brown as my base sugar cookie. I misplaced the frosting recipe, but it wasn’t hard. It was a simple recipe using confectioners sugar and the frosting hardened after about 5 minutes. 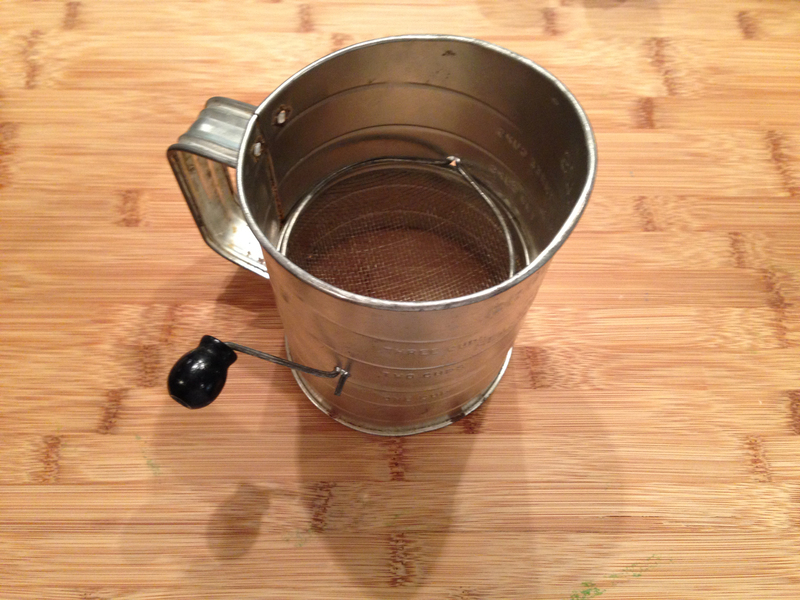 Since I didn’t think of blogging about the baking process, I don’t have any pictures from the actual making of the dough except for this old sifter that belonged to my grandma. I cut the cookie dough to the size of a standard ATC and baked them in the oven. As expected, the cookies came out looking like ATC blobs rather than cards. I took a regular paper ATC card, and trimmed the excess cookie off so that each cookie was the size of a standard card. Next I coated the card with frosting to be my blank canvas. 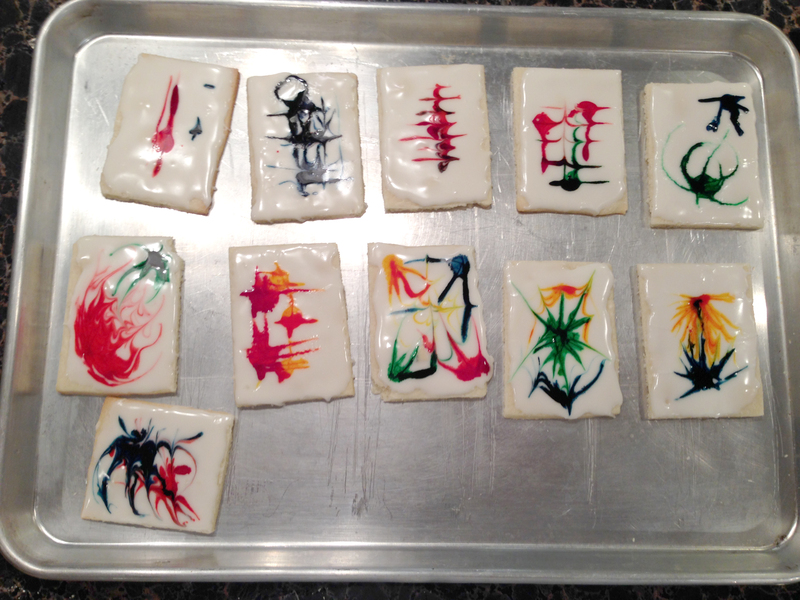 Finally, drip a few drops of food coloring onto the “canvas” cookie. Swirl/draw/create with a toothpick or other tool… and you should have your own modern art piece! Only coat one cookie at a time, as the frosting hardens within a few minutes. You need the frosting very soft when you add the food coloring. 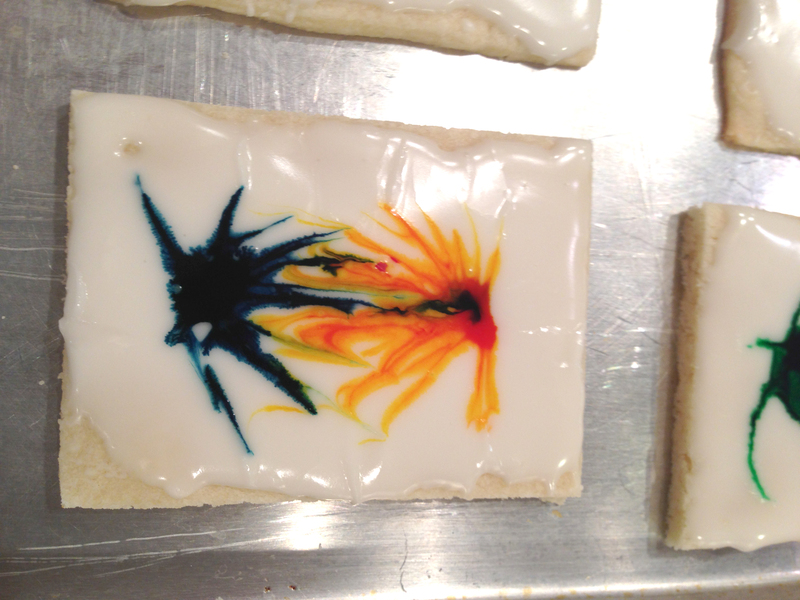 Try mixing colors to get a cool effect on the cookies. To be honest, the cookie looked better than it tasted. That’s ok though… this cookie was more about looks than taste.